Believe it or not, we are already in full swing organizing the 7th annual East Bay Mini Maker Faire! As always, it will be full of breathtaking new treats as well as the perennial favorites you enjoy every year. We hope to see you there with your family and friends to enjoy a day of discovery and delight. Our 2015 show was the largest yet, with 7,000 people attending and 199 exhibits / performances / talks & workshops—plus 23 food and drink vendors. Perhaps the most important metric though, was the number of new makers at the show: 50% of the makers had never exhibited previously at East Bay Mini Maker Faire. That is an inspiring factor & indicator for a show in its 6th year, and points to the ongoing evolution and expansion of the Maker Movement in the East Bay. We want to especially thank our many Makers for giving up their day (and days prior in preparation!) to share their work with all of us. A Maker Faire is nothing without them. 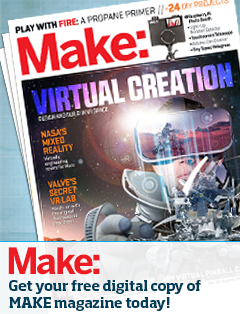 Make: magazine and Maker Media are the founding organizers behind the global Maker Faire brand. We appreciate their support and their presence in Learn to Solder and the Maker Shed at the show. Google, Blue Shield of CA, Trackers Bay Area, Sprout by HP, Kudo3D, UC Berkeley, ADT, PlayWell TEK, Seeed Studios, The Gate, City of Oakland, Brushstrokes, Camp510, East Bay Express, Parent’s Press, and LanSharks. Finally, thank you Attendees! You appreciate and celebrate the lifelong learner, the curious ones, and we thank you for your vote of support for Making and creativity. We hope you had a blast & see you next year! C.H.I.P. @ East Bay Mini Maker Faire!! Wrapping up install here on site and excited for gates to open in the (mid) morn! We have some surprises in store—there’s action and jaw dropping stuff from the moment you walk in! Your bike! Free bike valet parking on 42nd Street – come in style! Friends! They can still get tickets here & pre-purchase day-of tickets before hitting the gates. But lots of folks will just show up at 360 42nd Street, buy a ticket, and see what happens. And that’s great too. Either way, see you tomorrow! The gate opens at 10am. Bits of cheese, sprigs of parsley, egg, and meatballs… not everything at the Maker Faire is made of metal and plastic. For an edible Maker experience, look no further than Sunday’s cooking demonstration by Christopher Boswell. 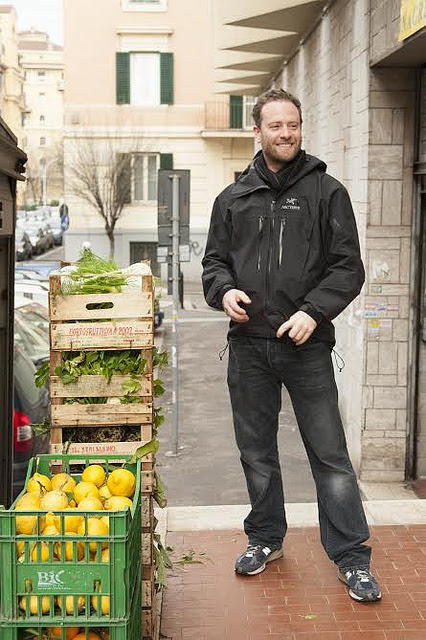 Before becoming chef of the Rome Sustainable Food Project, he attended the California Culinary Academy, then trained under Alice Waters at Chez Panisse. He is the author of three RSFP cookbooks: Pasta, Verdure, and Zuppe. What makes a good meatball? What makes a good Italian meatball is the tenderness, which comes both from the bread & the cooking time. The cooking secret is also to simmer them gently not boil them rapidly. Do different cultures have different meatball traditions? The idea of the meatball is found all over the world. Whether it’s a Bahn Mi meatball, a Matzoh ball, a kefta, or dishes from many other cultures, they are all from cucina povera,or food of the poor. In fact, many of the techniques like adding bread or simmering in broth are designed to feed a good amount of people with a little bit of food. 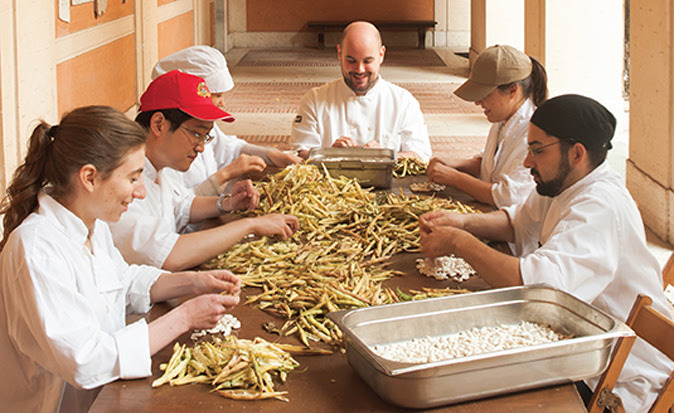 Did your approach to cooking change while working at the Rome Sustainable Food Project? Do you have many chances to teach people about food? My favorite food to cook and eat is Italian food, but having a chance to live for 8 years in Rome had a huge influence on how I approach both eating (because my love for cooking is really second to my love for eating) and cooking. The Roman palate is very complicated. You have flavors that are very very decisive yet the dishes are light for the most part. They have a way of even taking what would seem like a very heavy dish and preparing it in a way that doesn’t leave you feeling like you’re in a food coma afterwards. Italians in general also eat tons of greens, beans, grains, and vegetables, so I loved eating lots of those along w/ pasta to fill your belly, wonderful cheeses, and a little bit of meat. Meatballs are originally a food of the poor because they were made with mostly stale bread soaked in milk with the addition of any meat scraps on hand. Today, meatballs in Italy still contain lots of bread – and are thus quite light. In fact, our meatballs are made with equal parts bread and meat. Meatballs can be made in several different ways, with or without tomato sauce. They can be browned in a pan, deep fried, first pan fried or directly simmered in tomato sauce. If they are made in the sauce, the tomato sauce is used for the pasta as the primo, and the meatballs are served as the secondo. We like to serve the meatballs this way at the RSFP: the spaghetti gets tossed in the tomato sauce and the meatballs themselves get served as the secondo. Feel free to top the spaghetti with the meatballs or serve them on the side as a second course. This recipe works best with bread that is at least 2 to 3 days old – but day old bread will work. Using stale bread that has been rehydrated allows it to crumble and become flaky. Put the bread and the milk in a large bowl so that the bread is fully submerged in milk and soak it for 45 minutes. Season the ground meat with salt and pepper. Add the hot pepper, oregano, parsley, garlic, Grana Padano, and egg to the meat and mix thoroughly using your hands and set it aside until the soaked bread is ready to use. Squeeze the milk out of the bread and discard the liquid. Crumble the soaked bread using your thumb and forefingers into the ground meat mixture. Knead the bread and meat mixture. 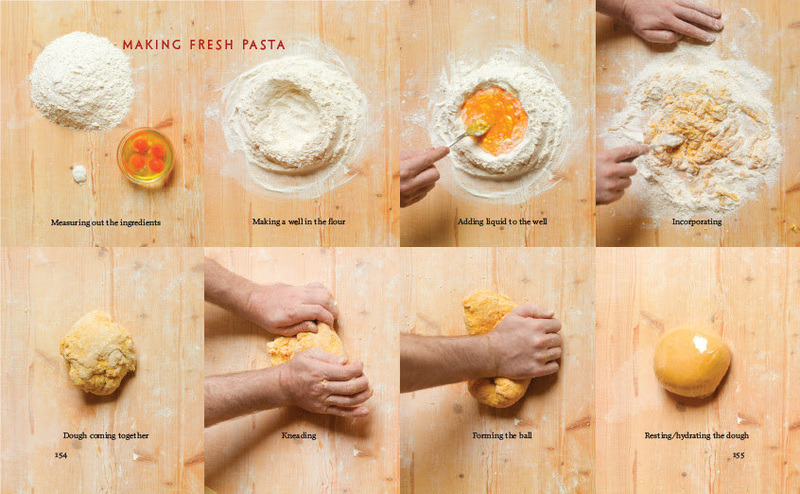 Once the impasto comes together, knead it a few more times as if you were kneading fresh pasta. Form the mix into small balls, about the size of a golf ball. Put the olive oil in a 14­inch (TK cm) high­sided sauté pan over medium heat. When the oil is hot, gently fry the meatballs for 3 or 4 minutes on one side, or until they are golden brown. Carefully turn the meatballs over using a small spatula or spoon and add the garlic. Cook until the garlic is golden, then remove and discard it. When the meatballs are golden brown, add the tomato puree, basil, and hot pepper flakes, and cook, covered with a lid for 50 minutes, or until the meatballs are very tender. They made use of their widely varied skills. Club members created Rodeo-style comedic skits and stunts, featuring their metal steeds and riders as clowns, rustlers, and beauty queens. 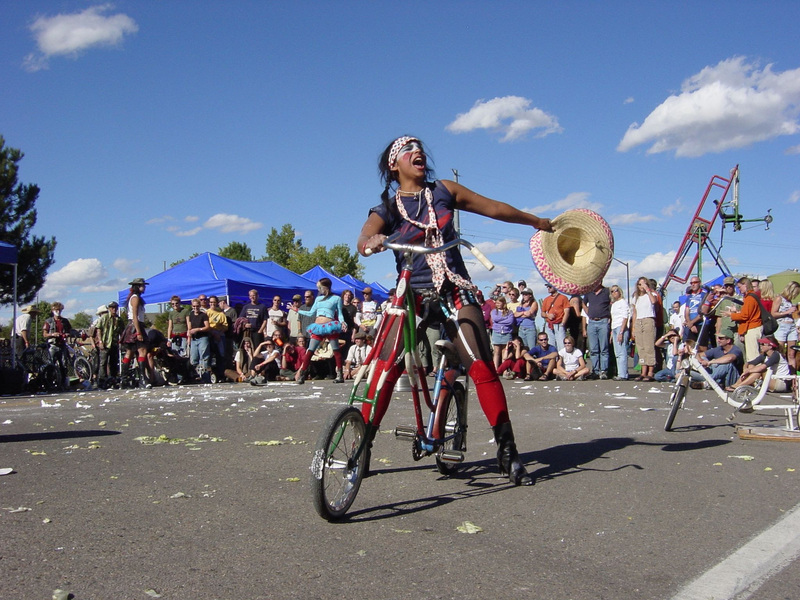 They rope audience members into the show, encouraging them to compete in contests of bike-riding skill, such as barrel racing, piñata-bashing and tall bike jousting, often accompanied by their own mariachi-country-punk band “Los Banos.” For the past ten years, the independently owned and operated Heavy Pedal Cyclecide Bike Rodeo has toured around the US and down into Mexico. Flush with success from the rodeo show, they created the nation’s first and only pedal-powered carnival midway. 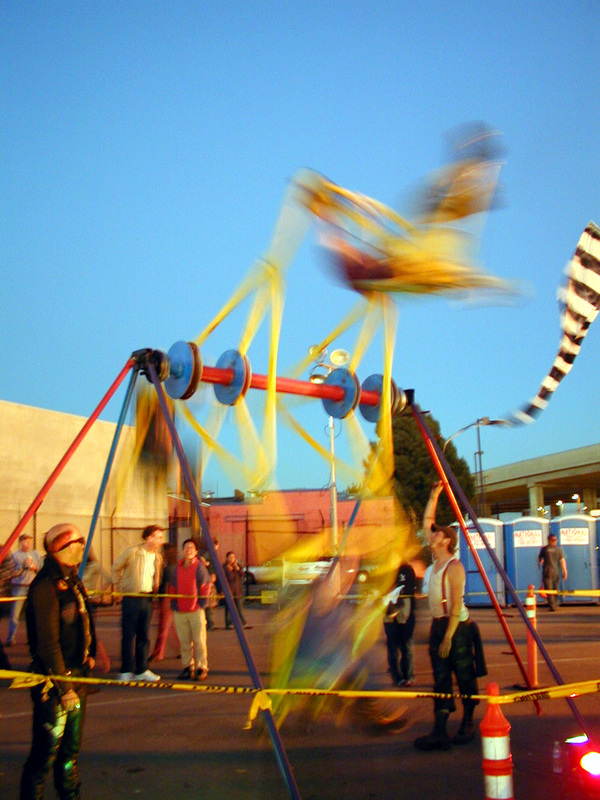 First came the exciting Dizzy Toy, followed shortly by the Pedal-Powered Ferris Wheel, the nostalgic Bicycle Carousel, the charming Flight of the Bumblebee, the cacophonous Axe Grinder, and more. They’re still building, and they’re still devoted to the idea of the bicycle as a piece of interactive kinetic sculpture that can entertain, startle, and excite. 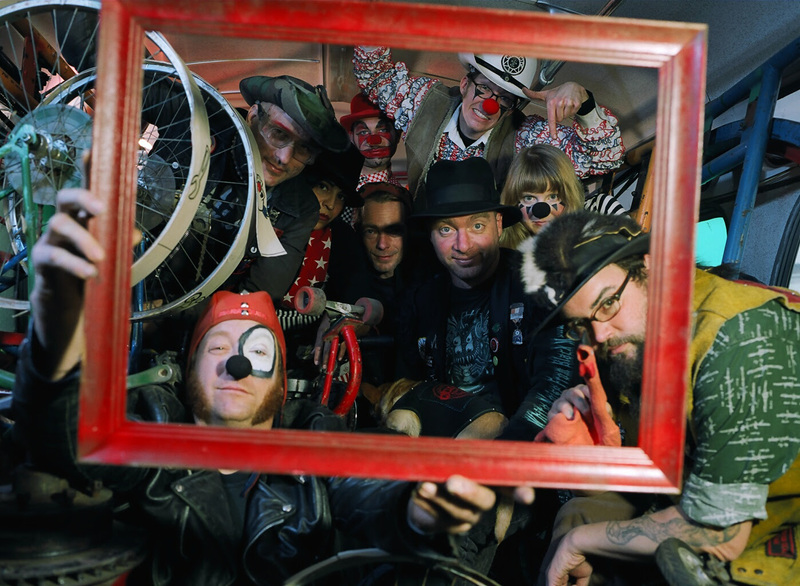 This year at the Faire, Cyclecide will have three of those midway rides plus a whole pen of hacked and mutant bikes for your riding pleasure. Food — and Beer — at the Faire! The food at the Faire is fantastic. Curated by the folks behind Bites off Broadway, our food truck and booth and beer lineup is pretty inviting! Who is Gonna Beat 27 Crates? 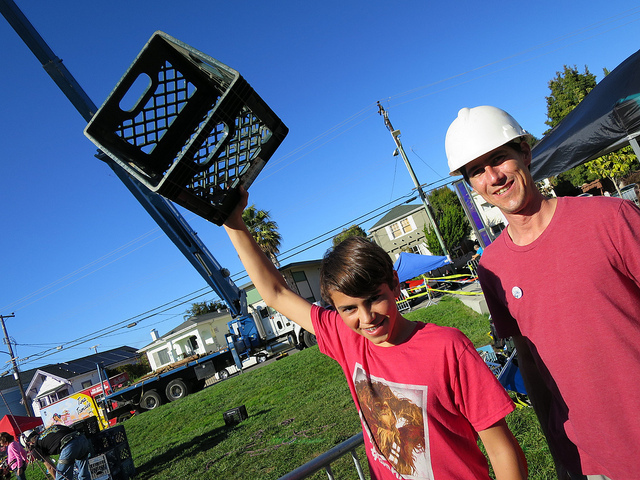 Last year, 15 year old Larkin White had the top stack at East Bay Mini Maker Faire’s Crate Stacking zone. 27 crates!! Love to know who is going to take the Golden Crate this year. Will it be you? 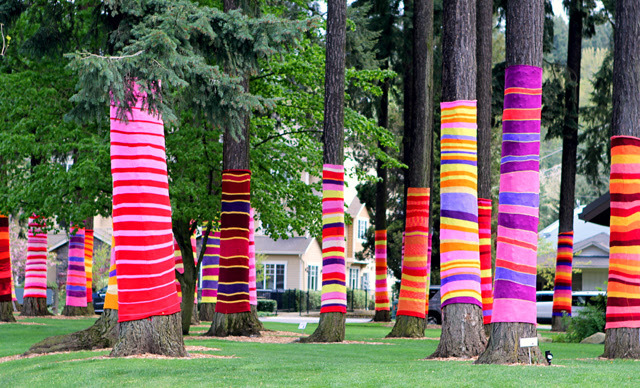 No one knows what this year’s yarn bombing will bring, not even the yarn bombers themselves. 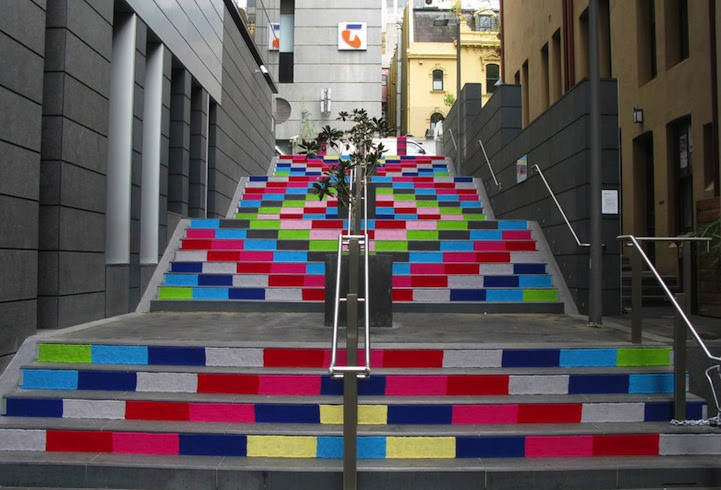 Yarn bombing, a street art that uses knitted or crocheted yarn, takes advantage of shapes and spaces in public areas to make something new. 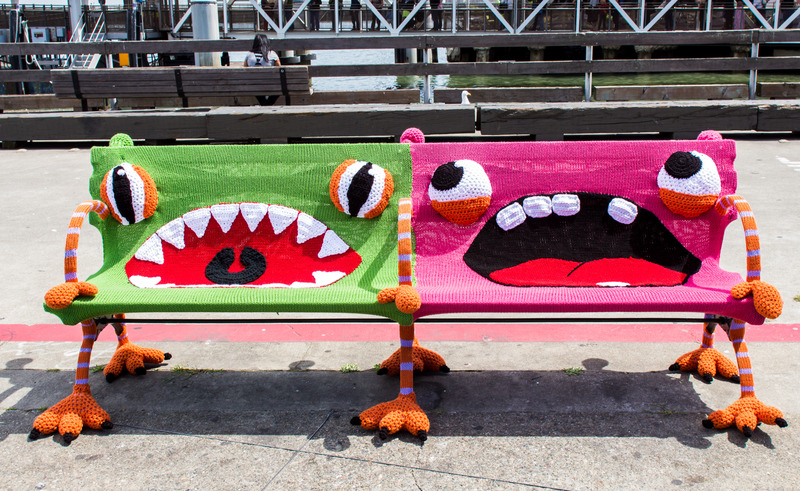 A bench at the Embarcadero inspired local artists Lorna and Jill Watt to make this yarn bomb. 3 miles of yarn, 30 hours of crochet, and 3 hours to install . Other yarn bombs weave over multiple objects or between them, or both. 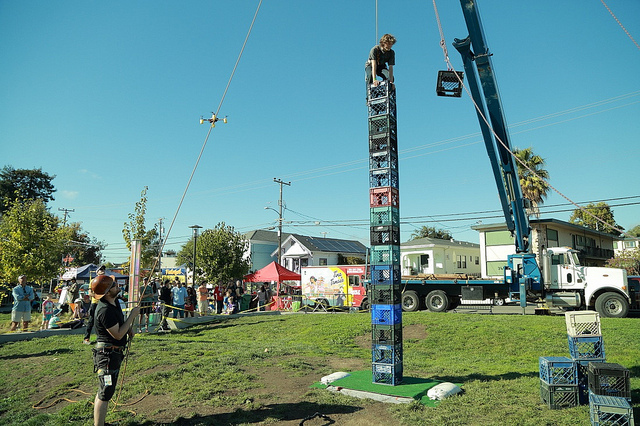 At this year’s East Bay Mini Maker Faire, artist Ruth Tillman and the Machine Knitters Guild of the San Francisco Bay Area are collaborating to work on an onsite installation. Attendees will be able to try out a knitting machine and learn what it can do, and help make pieces for a yarn-tagging installation at the Faire. Learn techniques and skills for your crochet and knitting. You can see how automated color patterned knitting works, and what Knitters Guild has been making using an Arduino-hacked knitting machine. The future of underwater exploration can fit in your handbag, according to the Makers at Berkeley-based OpenROV. Their small, maneuverable robots operate as miniature submarines, giving a clear view of the world below the surface. They can be piloted by anyone with a laptop, and you can see them in action—and operate them!—this Sunday at the East Bay Mini Maker Faire. OpenROV founders Eric Stackpole and David Lang call their inventions “drones” and refer their motion as “flying,” rather than “swimming,” because of the smooth propulsion of their machines. 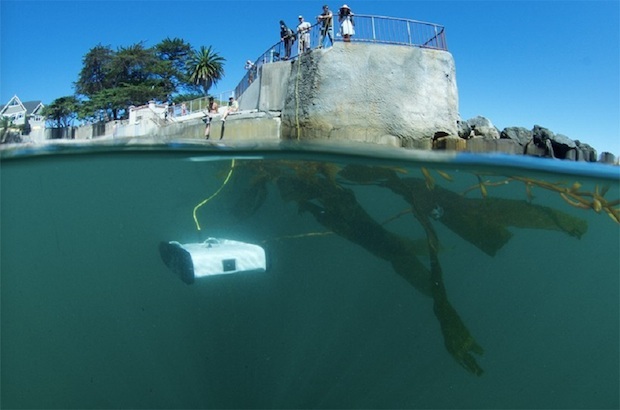 The OpenROV is the size of a toaster and can go as deep as 100 meters. In their water tank at the Faire, OpenROV team members will show some of their half-dozen models under development, including their latest Trident flier and their “2.8 ROV,” still in a prototype stage. Like their previous models, they come with video cameras and open-source software, along with a host of new features. The newest innovation may be their eventual integration with the Oculus Rift virtual-reality headset, allowing a user to “see” through the lens of the drone and to control it with a tilt or turn of the head. “It gives you a sense of what it’s like to be a fish,” says Thomas Moye of OpenROV. 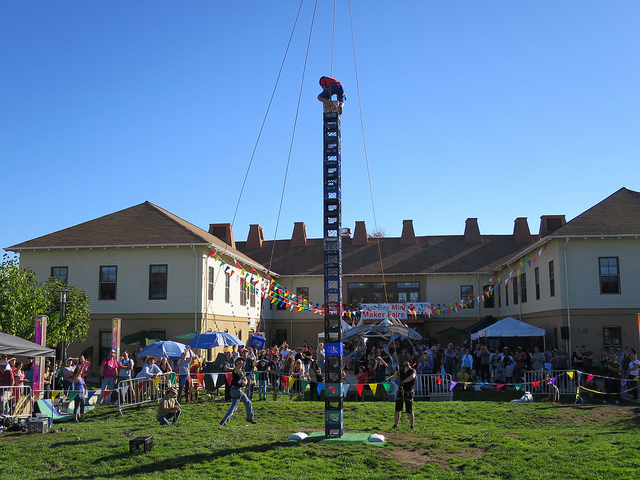 Very happy to share our 2015 East Bay Mini Maker Faire Schedule of presentations & performances! 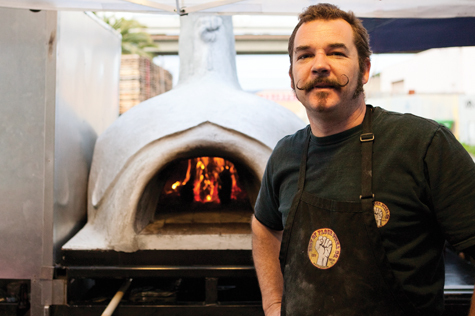 From mushrooms as materials with Phil Ross, to East Bay Brass Band, to meatballs with chef Chris Boswell, to drones with Eddie Codel, to robotics with Rosanna Myers and Helen Lurie… it’s an impressive list of massively talented folks. Can’t wait for 10/18!